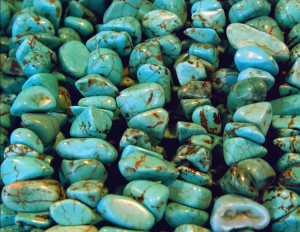 In many traditional cultures, turquoise has been valued for its color, which evokes both the sky and water. Because of the significance of the sky, which facilitates the passage of the sun and the coming of rain, turquoise is often referred to as “the sky stone.” Turquoise is associated with life, health, fortune, and blessings. Turquoise can be found in medicine pouches, incorporated into Zuni fetishes, carved into beads, and set as larger stones in traditional Navajo and Pueblo silver work, although it wasn’t until the late 19th century that turquoise was associated with silver jewelry, when Atsidi Sani, a Navajo silversmith, began incorporating turquoise stones into the Spanish-style silversmithing he had learned as an apprentice. Silver and turquoise jewelry was popularized by the burgeoning tourist trade in the Southwest, and nearby Pueblo people, Hopi and Zuni, also began making turquoise jewelry. "Turquoise beads at the Tucson Rock and Gem Show, February 3, 2007" by cobalt123 is licensed under CC BY-SA. 1966 Turquoise and the Indian. Denver: Sage Books. World: 15,000 Years of Inventions and Innovations. Facts On File, Inc., New York. 1975 Navajo Kinship and Marriage. Chicago: University of Chicago.